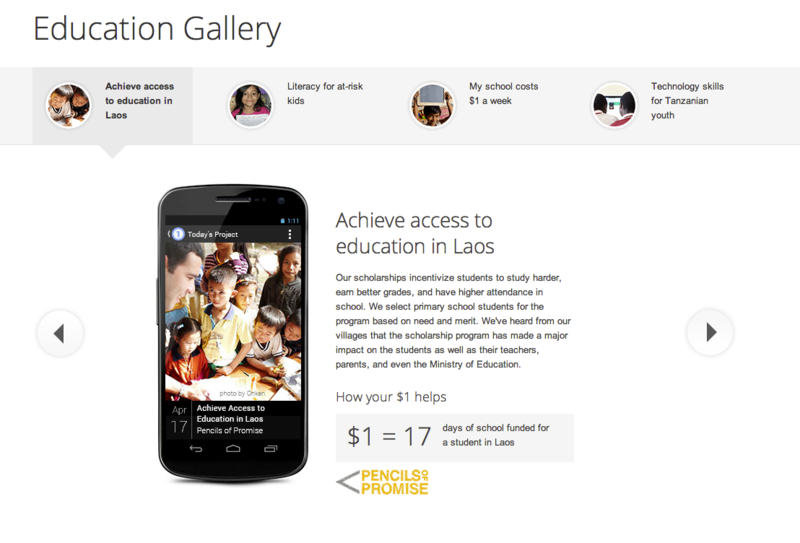 This week, Google launched its latest offering as part of the Google for Nonprofits program. (If you’re not a part of this program, it’s free and easy to sign up–if you’re a 501(c)3, you need to do it! Sign up for this program here. Here’s how it works. Your organization, as a Google for Nonprofits participant, can create a project to submit to the program. Let’s say, for example, that you need $2,500 to build a new fence around the yard at your shelter. So you write up a little description, maybe include a photo. You can submit as many projects as you like. Meanwhile, I’m a user who has downloaded the One Today app. It asks me for my interests and the kinds of organizations I care about. I have indicated where I live and that I like animals, so it “decides” to show me your project. 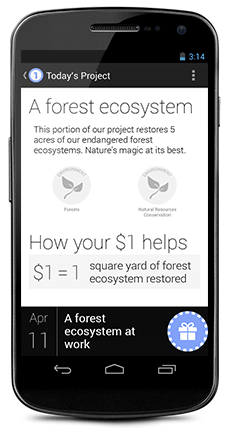 (I only get to see one project a day on my app–hence the name, “One Today”) So I see your project, and I can decide if I want to donate $1 to it. I can’t donate any other amount–just $1. But say I really love your project and/or your organization. The app encourages (and makes it easy for) me to share the project with my friends. So I go on Facebook, Twitter, Instagram, etc. and share it with my friends, encouraging THEM to donate $1 as well. $1 doesn’t seem like a lot, but what if 500,000 people see your project on any given day? Even if just ONE PERCENT of those people donate $1, that is $5,000! A DAY! So here are some other things to consider, pros and cons. Does it cost your organization anything to participate? There’s no up-front charge. You are charged a portion of every donation for the credit card processing–there’s really no way to get around this (no matter how you accept online donations, you’re going to pay a fee). Google takes 1.9% of ever transaction. So for every $1 donation, you actually receive 81 cents. How do people pay? Will you definitely get the money? Here’s the biggest problem with this whole thing–at least in my opinion. When I decide to make my $1 donation to your project through the One Today app, it basically asks for me to “pledge.” I don’t enter my credit card info or anything. So say I see your project on Monday, and pledge my $1. I see a different project from a different organization every day, and say I pledge to their projects too, on Tuesday, Wednesday and Friday. So by now I’ve made $4 total in pledges. Google will send me an email saying that I need to go online and pay. The other thing is, my ONLY option for paying my pledges is to use Google Wallet. This is a lot like Paypal, but it’s owned by Google. It’s much less popular than Paypal, and many fewer people use it… so if I don’t already have an account, or I don’t want to open one, or I don’t remember my password… I’m probably just not going to pay my pledge. So this could be really bad for your organization, if lots of people don’t follow through and pay their pledge. Why is Google doing this? Well, obviously, it’s a great PR move for Google. But they also make a ton of money. They keep that 1.9% of every donation as a processing fee. So, say that 100,000 people per day make a $1 donation and actually follow through and pay their pledge. That’s about $1,900 per day that Google makes. Over the course of a year, that’s nearly $700,000. Not a bad little passive income. Granted, this is not going to be Google’s big moneymaker, but it doesn’t really cost them anything either! So how can you take advantage of it? The key to being successful with One Today is coming up with a good campaign that is manageable in size (since we’re talking about $1 increments, I wouldn’t suggest trying to use this app to raise $5 million for a new building), and one that you can easily show the successful results. If you get the $2,500 to build the new fence, show photos and a video of dogs playing in the new, safely-contained yard and put it on your website and social media. Donors will see that you followed through and utilized their donations, and who knows what they might do in the future? Maybe a bigger donation will come from it. It also gets you a lot of new exposure. The One today app will show your project to interested people all over the United States. Someone living in a state 3,000 miles away would never know about your organization, but they learn about you through this app. Get that person signed up on your email list and start cultivating a relationship. It doesn’t matter where that person lives–people’s credit cards work just fine no matter where they are! What do you think? Will you pursue One Today? Do you think it’s a good idea, that it’s worthwhile? What questions do you have? As always, email me or post below and let me know how I can help you. I like the idea of small increments and sharing the project. Speaking personally, it’s much easier for me to get engaged if the ask doesn’t start with “$100 $50 $25 Other:$____” (Which somehow makes me feel cheap and tends to make me walk away even if I really wanted to help.) The only concern I have is the one suggestion per day. I wonder if the readers might end up turning off the feed? Perhaps a weekly suggestion might have been better – a bit less overwhelming. Good points, Lian. And your concern about the daily feed raises an important point, too. It’s not an email feed–the donor would only see the “project of the day” when he or she opens the app on the phone. So that is another issue. What if I go a week without opening my app? What if I open it two or three times but I don’t see projects I like, so I lose interest? Even if they have a million people download the app, how many people will be opening it and checking it each day? Lots of questions here! If you only received 81 cents per one dollar donation, that would actually be 19% (not 1.9%) in fees taken off every donation. If we put our nonprofit’s request on Google’s One Today but then also put it on Facebook and pay to use Facebook’s Boost system could we not gain greater exposure? What would be the best way to announce on Facebook that we have a non profit request on Google’s One Today? Any ideas would be greatly appreciated. did notice the viewing rate on our Facebook page increased somewhat. Anne, I think it would be a great idea. When your nonprofit is featured on OneToday, you need to get EVERYBODY going to the app that day. It’s very urgent. So you should send an email blast, boost a post on Facebook, buy an ad on Facebook, encourage everyone you know to share it, get your community newspaper/TV station/popular websites to talk about it–you’ve got to maximize your exposure on that ONE DAY. So yes, a facebook ad is a great idea!